Records Fall in 2016 Blue Marlin World Cup! West Palm Beach, Florida—The Blue Marlin World Cup marked its 32nd anniversary with several important milestones in 2016. A record fleet of 162 teams signed up to participate in the one-day, winner-take-all shootout that takes place each year on July 4, which also resulted in a record payout for the winners. And the marlin didn’t disappoint either, with the fourth-largest blue marlin in the event’s storied history taking home first place honors. Mark Rideout from the United Kingdom had fished the World Cup in the past, but this would be his first year competing aboard his own boat, a 33-foot Rodman named Blue Makaira. Rideout and his team selected the fish-rich waters of Madeira for their eight hours of fishing, and were able to land a 983-pound blue marlin. Incredibly, this fish was the fourth-largest ever caught in World Cup history, surpassed only by the three thousand-pound-plus “granders” caught in 2010, 2004 and 1993. In another notable twist, Blue Makaira’s Capt. Nuno was the deckhand on last year’s Blue Marlin World Cup winner, which was also caught out of Madeira. As a result of their win, Rideout and his team are now qualified to participate in the Offshore World Championship, slated for April, 2017 in Quepos, Costa Rica. 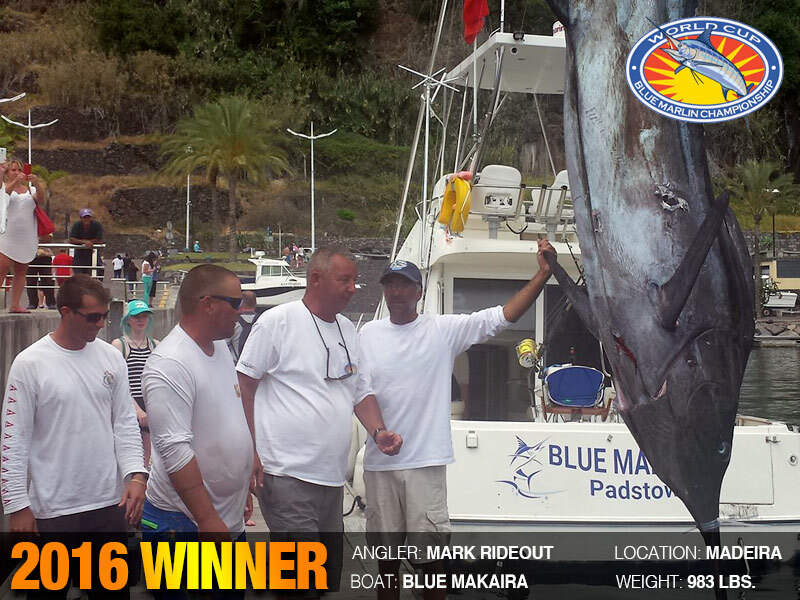 And while there is only one winner in the World Cup, Blue Makaira was not entered in the optional Big Blue Challenge jackpot, which left a considerable amount of cash still up for grabs. That would be won by Stephanie Choate and her team on Reel Addiction with a 625-pound blue marlin. Choate and company fished out of Bermuda with Capt. “Curly” Cragin aboard his 48-foot Billy Holton charter boat. Choate won the Blue Marlin World Cup in 2014 with a 656-pound blue marlin she caught while fishing off Kona, Hawaii. 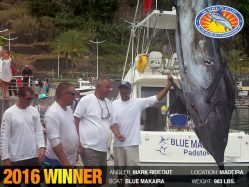 This year’s Blue Marlin World Cup saw excellent international representation, with participating teams fishing in such far-flung destinations like Papua New Guinea, Fiji, Cameroon, the Seychelles, Mozambique, and Senegal as well as popular big marlin hot spots like Madeira, Cape Verde, the Azores, Bermuda, the Bahamas and the United States. There were 55 boats fishing out of Hawaii alone this year. Social media also played an increased role in the visibility of the 2016 Blue Marlin World Cup. Tournament director Robert “Fly” Navarro posted updates using Facebook’s Live Broadcast feature at regularly scheduled intervals throughout the event, keeping fans and participants up to date on all the action. The final broadcast received over 10,000 views from across the globe, proving that the popularity and reach of this event spans all borders.